Combine all the vegetables. Cut the lemon and the lime in half and squeeze the fresh juice into the vegetable mix. Season with salt and pepper. Let sit for 15 minutes. Taste again and add more juice or salt and pepper if needed. It’s great for dipping, on top of fajitacos and with turkey-bacon sandwiches. I love accidential recipes! Lots of great options for the big game. 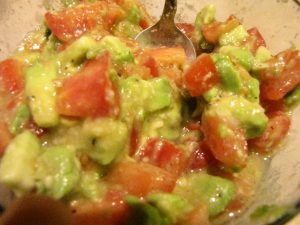 I love avocados and I am obsessed with tomatoes, together with some heat is even better. Yummmm! I absolutely love avocado and this sounds so good! I can’t wait to make it! Avocado is my FAVORITE. Yum! Accidental recipes are the best. Tomatoes and avocados pair great together. Love this! Looks so quick and easy to whip up. I am always in need of recipes like this! Thanks! This combines two of the best dips to have at a football party….salsa and guac! This is right up my alley – could eat this with a spoon! I love accidental recipes. They sometimes turn into the best and avocado in salsa is AMAZING.